Under the hot, bright lights of the tv cameras, in the swirling course of unfolding events: “You’re Fired,” loud and clear, a declaration echoing from yet, another, unscripted SHOW of a post real presidency. Casting his spell through the lens of the camera, TRUMP is a true performer, laser focused on absolutely nothing but the ratings. That is all: nothing more, nothing less. He cares not a whit about his staff, his agencies, his administration, the people, the world. No, it is all about the ratings and his grip on the locus of the 24/7 intoxication of the media spectacle. Always on. Without a pause. 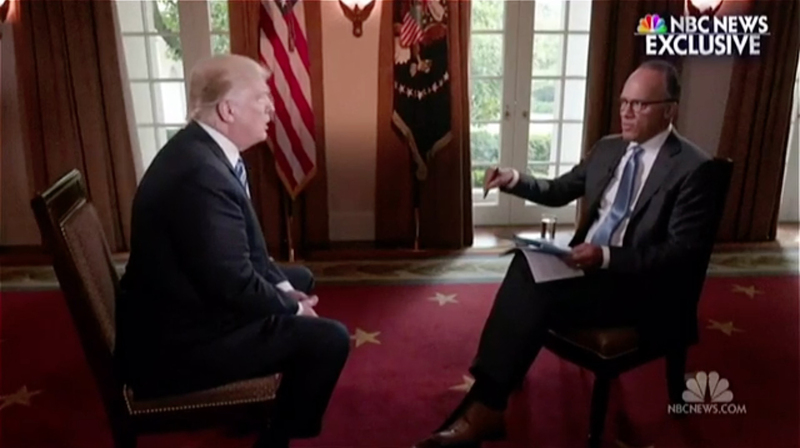 The telegenic image of TRUMP’s interview with NBC anchor Lester Holt might well have been a scene straight out of The Apprentice, another cathartic firing, in which TRUMP delivers the explanation, the nasty satisfaction, the seductive rationale behind the take down of another wannabe aspirer to TRUMP Tower. This time the take down was James Comey, the director of the FBI, but no matter, the gravity of the moment and its context is totally irrelevant. It is about TRUMP in the act of Conquest. Winning. Power. The Vanquisher of anyone who dares challenge his absolute superiority. Through the spell of the camera, TRUMP bears down on his prey, like a media carnivore lusting after good, red political meat. After throwing his deputy Attorney General Rod J. Rosenstein to the dogs, slopping up the bloody mess with his deputy spokesman Sarah Huckabee Sanders and VP Mike Pence, TRUMP sits on the edge of his seat like an all-powerful Emperor from ancient Rome, basking in the denouement of an administration in ruins. It’s all good ratings. For TRUMP, there is absolutely no differentiation between the Oval Office of the Presidency and the Board Room of the Apprentice, it’s all a stage for SHOWmanship and TRUMPological grand maneuverings to keep all eyes bearing down on Him. And yes, the collective gaze of the world is fixated on his every turn of word, every constructed lie, every charged insult, the pompous grandstanding, the relentless fabrications, all coagulating into an impossible matrix of twisted logic that sears its way and embeds itself into the consciousness of a helpless television audience. We are all caught in TRUMP’s Web, entangled in its sensationalism, which has absolutely no other expressed purpose other than the ratings. “You’re Fired” resounds endlessly and circuitously through the neural network of the media brain, all of us whiplashed into submission to the clarion call of seduction. We • just • simply • cannot • take • our • eyes • off • of • this • disaster… no matter how hard we try. And the more we resist, the more we are stuck in the Web, dripping with sticky, poisonous residue of TRUMP’s poisonous venom.